Cyanobacteria appear in both salt- and freshwater setups and are known as red slime or blue-green algae. Cyano is unicellular. It cannot be detected even when using a common microscope. What can be seen as slime are thousands of cells bound together by a protective slime coat, while some break away floating freely in the water. Cyano, being a hybrid, is difficult to remove. Factors for growth are multiple and dealing with the algae-bacteria needs to be on multi levels in order to be effective. Growth factors include, light, nitrogen, dissolved organic carbon, and CO2. All of these factors are basically interchangeable, meaning that one or two factors can be limited, but it won’t stop the algae-bacteria from utilizing the remaining factors, nor will it stun their growth. For the sake of completeness, some limiting factors influence the shape and appearance, but not the occurrence itself. Light might be an obvious factor as Cyano is able to photosynthesize, but eliminating or reducing the light will not stop the growth. Recalling that Cyano is a hybrid, it will rely on bacterial characteristics to produce energy for growth. Reducing the access to carbon as an alternate approach has no effect by itself either, since the algae-bacteria can use CO2 as a sole carbon source. A closer look at our lighting may reveal an aging bulb with diminishing wave-lengths. This may create favorable conditions. For the bacteria-algae light plays a more important role in freshwater setups. For saltwater, while light can’t be ruled out as a contributing factor, growth is dominated by dissolved carbon. Cyanobacteria are often treated with antibiotics, addressing the symptom rather then the cause. Antibiotics are not very selective in what bacteria get killed. Cyano is gram negative (thin cell wall) in much the same way as the beneficial bacteria are. Many bacteria in fresh- and saltwater, especially the ones symbiotic with live rock and sand, are gram negative. All of the bacteria will be affected, either being killed or severely damaged. In consequence their ability to reproduce will also be negatively effected. The bacterial balance is delicate and any disturbance is likely to be responsible for larger problems and fatalities i.e. ammonia spikes, cloudy oxygen-depriving water. Another consideration when using antibiotics is that bacteria will become increasingly resistant. This resistance may make the antibiotic useless if used for treating fish diseases. Of course none of the contributing factors causing the cyano have been resolved by using antibiotics. Dissolved organic carbon is an immediate result of anything organic that has died off and gets decomposed by bacteria. Dissolved organics are a food source of the bacterial side of the bacteria-algae. Sources of dissolved carbon include, fish slime, algae, bacteria, digested/uneaten food, metabolic waste, live food, some aquarium additives etc. At this point it is worth mentioning that the protective slime coat is pure organic material, adding to the carbon content once it decomposes. In other words, the algae-bacteria contribute to a higher carbon content of the water, adding woes in the fight for its removal. Aquarium additives, especially pH controllers, contain bicarbonates. Bicarbonates convert into CO2, thus adding to the carbon levels. This also explains why Cyano is often found in saltwater; this setup has a naturally high bicarbonate level. Limiting dissolved organic carbon can help, but the bacteria-algae is capable of consuming all the carbon needed derived from CO2. 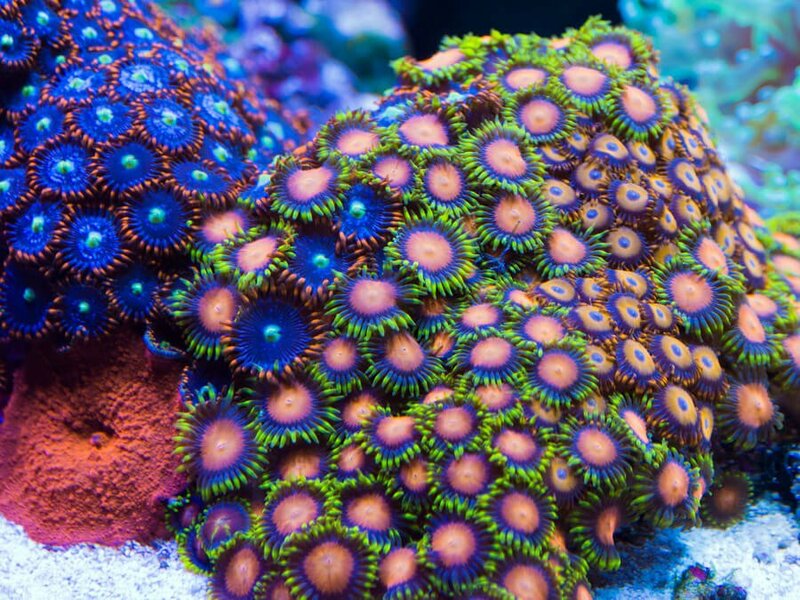 It is therefore important, especially for saltwater aquariums, to ensure a proper gas-off by water movement and adjustments of water flow. The more oxygen created, the better the degassing effect. Skimmers are effective tools, but need to be maintained frequently. A too small or ineffective protein skimmer, high waste loads, or a combination thereof will increase the dissolved carbon level. As with all types of algae, any uncontrolled growth indicates an imbalanced system, a disturbance of the biological/chemical equilibrium. Cyano is overtaking the aquarium because of a high nutrient availability. Nitrogen-nitrate is taken up from the water column, dissolved organic carbon is in abundance, and the wavelength of the light has reached favorable conditions for photosynthesis to take place more vigorously. Another interesting fact to know is that Cyano generally starts in areas where water flow is restricted.